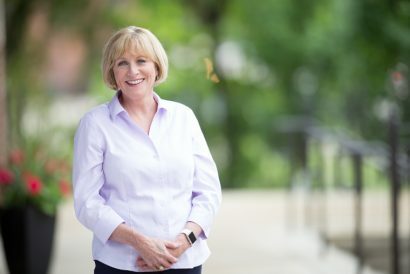 Cathy Glasson is a prospective Democratic candidate for governor, but she wants people to know she’s not a politician. “I think that’s actually a good thing, in some respects,” Glasson told the diverse crowd of approximately 35 people gathered at Lucky’s Market to hear her speak on Wednesday evening. Glasson is a nurse, and has been a union leader for almost 20 years. She helped lead the drive to create a union at University of Iowa Hospitals and Clinics in 1990s, and is currently the president of Service Employee International Union, Local 199, headquartered in North Liberty. She’s never run for office before, but launched an exploratory committee on May 31. It was the last session of the state legislature that convinced Glasson to consider a run for governor. In her speech, Glasson cited the stripping of most collective bargaining rights from public workers and cuts to essential services, including health care, as the some of the worst actions undertaken by the Republican-dominated General Assembly. What happened during the last legislative session is also what brought Kristie Doser to the dining area of the Iowa City Lucky’s to hear Glasson. Doser has worked with victims of domestic violence and sexual abuse since the 1980s. Seeing the impact of those funding cuts on a daily basis has helped shape what Doser is looking for in a candidate. “I want to hear from candidates about what their perspectives are on the individuals who are marginalized and are the most vulnerable in our society, and those who are in circumstances beyond their control,” Doser said. During her brief speech, Glasson touched some of the points Doser was interested in: Raising incomes by raising the state’s minimum wage to $15 per hour; Restoring full collective bargaining rights to public employees and making union organizing easier; Introducing universal health care, including coverage for mental health issues; Reversing the closure of women’s health clinics; Increasing funding for education at all levels, as well as addressing the problem of student debt and making tuition free at community colleges. Glasson promised quick and decisive action on all these issues. Glasson only spoke for 12 minutes, explaining she wanted to this to be a listening session and would rather have a conversation than give a speech. She then spent an hour going from table to table, talking with people about their concerns and ideas. Glasson has held 35 listening sessions in 12 counties and 14 cities across eastern and central Iowa since launching her exploratory committee. And she’s been hearing the same concerns from people in both rural and urban areas during those session, she explained after the event ended. Glasson also expanded on her desire to take immediate action on issues like raising the minimum wage. Glasson realizes many people may doubt that anyone running as a “bold, progressive candidate,” as she describes herself, can win in a state where 51 percent of voters voted for Donald Trump last year, and where Iowans spent decades reelecting Republican Gov. Terry Branstad. But Glasson feels her message and her approach will connect with Iowans, regardless of whether they live in cities or rural areas. But even if she wins, Glasson will likely face a Republican-controlled legislature opposed to her policy goals. She readily concedes that would be a great challenge.